[[White Night Riot: A Policeman's View|Police retaliated]] later that night with their own riot. They stormed a bar in the Castro, brutally beating customers and passersby. Some individuals were placed under arrest and a defense fund was formed. Punk bands like the Offs and the Blowdriers played benefits. 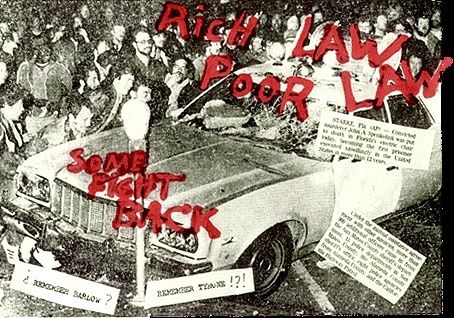 Later a photo of the burning police cars would grace the cover of the Dead Kennedys' first album. 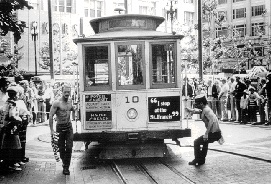 The San Francisco gay world was going through its adolescent phase. One of the less charming characteristics of adolescents is their tendency toward cliquishness as a means to define their world. There was also massive gay population growth, and perhaps due to the sheer overwhelming numbers, many people retreated a bit. Gay life became more factionalized and fragmented. As San Francisco lurched into [[The 1980s|the '80s]], the sense of community that had defined gay life in the [[The 1970s: Disco Fever and Respectability|early '70s]] seemed to get buried under a pile of special interests.